Understanding the history of Chenin Blanc is understanding the history of Cape wine and for prominent international critics it is nigh on South Africa’s signature white variety and symbolic of South Africa’s rising above its burden of history. Chenin has also overcome one of its greatest attributes – versatility – to stand as one of the most internationally lauded South African varieties. Leading wine critics are comparing Chenin-based blends with white Burgundy which surely ranks as the best value for money – anywhere? Although there is an accurate recording of when the first wine was made in the Cape – 2 February 1659 – there is less certainty surrounding the early varieties. However, we know that during that first century there were important contributions by Chenin, Semillon, Palamino, a few muscats and Pontac, which saw the beginnings of the Cape tradition of producing more whites than reds. While they all waxed and waned, Chenin – while never as widely planted as Semillon (Groendruif) under British rule – remained a feature and was one of the grapes grown at Constantia in the eighteenth and nineteenth centuries. As recently as 1990, Chenin Blanc comprised more than 35% of plantings and currently comprises around 18% of plantings and over 30% of white-wine varieties. The rise in brandy production saw yet another increase in plantings. However, Chenin’s real emergence – though anonymously in keeping with its Cinderella image – was Lieberstein, the first brand marketed nationally by creators Stellenbosch Farmer’s Winery (SFW), triggering a revolution in the drinking habits of South Africans and yet another spate of plantings. 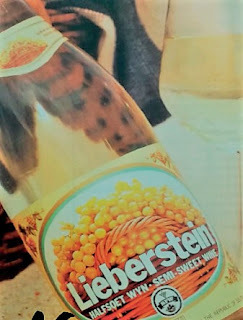 In 1964, Lieberstein was the largest-selling bottled wine in the world. It was only a year earlier, in 1963, that Professor Orffer at the University of Stellenbosch matched the Loire variety with what had been known here as Steen or Stein, both of which have since fallen out of common usage. Another of Chenin’s earlier successes was under a nom de plume, this time as Nederburg’s Edelkeur, the Cape’s first unfortified botrytised dessert wine. In 1972, Nederburg entered the 1969 Edelkeur in an international wine competition in Budapest – and it was judged the best wine at the show. Edelkeur became one of the calling cards of the Nederburg Auction (now in its 44th year) and went on to win many international awards. Depending on who you ask, Chenin’s shattering of its façade arose from Michael Fridjhon’s campaign in the early 1990s, co-opting Wine Magazine’s Harold Eedes to launch, in 1996, the Chenin Blanc Challenge. Others attribute Irina von Holdts' 1995 launch of her Blue White Chenin Blanc, apparently the first to champion old Chenin vines. Irina was the 1st chair of the Chenin Blanc Association (CBA) in 2000, while Rosa Kruger is the undisputed current champion, along with the likes of Ken Forrester, Eben Sadie, Bruwer Raats, Mullineux and more. Earlier this year, Christa von la Chevallerie’s Nuwedam Chenin Blanc 2017 – from a vineyard planted in 1974 - became the first wine to be launched bearing the Certified Heritage Vineyards seal of the Old Vines Project, the first wine in the world to bear the certified - by a national authority - date of a vineyard. As recently as 1993 white grapes occupied 81% of the total vineyard area, much of which was destined for distillation and brandy. With the lifting of sanctions, international demand required more international red varieties and Chenin was once again to bear the brunt, particularly (and tragically) the now treasured older vines. The Cape, however, still has more Chenin than any other wine-growing country with some 2700 ha (of 17 700) more than 30 years old, while there are 3467 ha of more than 20 years old. The un-irrigated old bush or un-trellised vines often produce among the best examples. As the Cape reinvents itself, Chenin each year tends to be the most frequently uprooted as well as newly planted variety, particularly from the 1990s with the shift to red varieties. In 2016 – the latest available stats - more than one third of new white plantings comprised Chenin Blanc. The first ever International Chenin Blanc Conference will be held in Angers, France 1-3 July 2019, with the CBA part of the Steering Committee.